It's Windows 7! And it's final! Computer criminals could soon be eavesdropping on what you type by analysing the electromagnetic signals produced by every key press. By analysing the signals produced by keystrokes, Swiss researchers have reproduced what a target typed. The security researchers have developed four attacks that work on a wide variety of computer keyboards. The results led the researchers to declare keyboards were "not safe to transmit sensitive information". Microsoft has announced that the final, official name of the next version of Windows will be the same as the codename - Windows 7 - making this the first version of Windows to keep its codename as its release name. 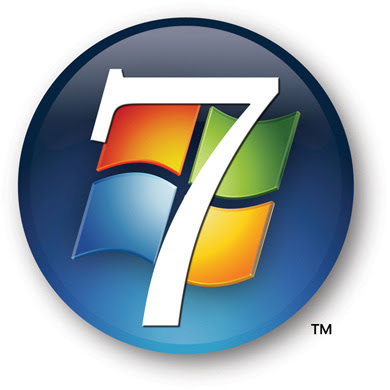 The codename Windows 7 has turned out to be more than just a codename this time around for Microsoft, as the company has agreed to keep things simple and keep the name Windows 7 for the final release of the operating system as well. 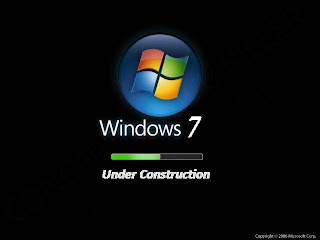 "The decision to use the name Windows 7 is about simplicity. Over the years, we have taken different approaches to naming Windows. We've used version numbers like Windows 3.11, or dates like Windows 98, or "aspirational" monikers like Windows XP or Windows Vista. And since we do not ship new versions of Windows every year, using a date did not make sense. Likewise, coming up with an all-new "aspirational" name does not do justice to what we are trying to achieve, which is to stay firmly rooted in our aspirations for Windows Vista, while evolving and refining the substantial investments in platform technology in Windows Vista into the next generation of Windows." This is the first time a Windows version has used its codename also as the name of the final release, and also one of the earliest naming announcements from Microsoft, as Windows 7 hasn't even reached its first beta version. A pre-beta will be handed out to attendees of the PDC and WinHEC conferences taking place later this month. What name do you like for Windows 7? Cast your vote at ZDNet. For me I would like to call it Windows OW1 so on... WHY? 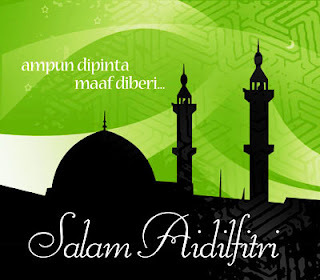 Because... in short it will becomes WoW! When someone asking me what is my OS so I can easily answer, "I'm using WoW Three! What's yours?" Windows OW can also be called Windows of the World, Web of Windows etc, etc, etc..! WoW! The purpose of most of these devices is to control how the network passes around information. This information is sent in the form of "packets". I will refer to the term packet several times in this article. It simply means the data that the network is transporting. I will now explain the purpose of the major components of a home network. A hub is a device that has several Ethernet ports on the back of the device. One of these ports will likely be labeled “Uplink”. This port allows you to connect multiple hubs together, if you run out of ports on your hub. If you do not have an uplink port on your hub, the hub cannot be easily extended if you run out of ports. 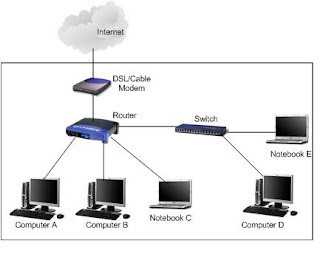 A hub is a device that attaches multiple computers on an Ethernet network. If you have a number different computers that you want to connect together, you could connect each to the hub. Any packet that is sent out by any computer on the network will immediately be transmitted to the other computers. Each computer will determine if the packet was really intended for it, and filter out packets that were intended for other computers. You really should not use a hub in a modern home network. You should always use a switch in place of a hub. Switches will be discussed in the next section. A switch is a device that has several Ethernet ports on the back of the device. One of these ports will likely be labeled “Uplink”. This port allows you to connect multiple switches together, if you run out of ports on your switch. If you do not have an uplink port on your switch, the switch cannot be easily extended if you run out of ports. A switch serves the same function as a hub. It allows you to connect multiple computers together, so that they can exchange packets. However, a switch is much more efficient than a hub. A switch will only send Ethernet packets to the computer that the packet was intended for. Because of this you should always use a switch in place of a hub. A router is a device that has several Ethernet ports on the back of the device. One of the connectors will be labeled WAN. You should connect the WAN port to the Ethernet connection on a broadband source, such as a cable or DSL modem. The other ports on the router can be connected other computers or switches/hubs that will share the WAN connection. Routers allow you to share your broadband connection with multiple computers in your house. Rather than connecting your computer directly into your cable or DSL modem you connect the router to the cable or DSL modem. Now any computer that you connect to the router will have access to the Internet. If you run out of ports on your router you can always connect an additional switch to the router. To connect a switch to a router simply connects the switch’s "uplink" port to one of the routers Ethernet ports. Of course, don’t connect to the router’s WAN port. The WAN port should only be connected to something such as a cable or DSL router. Some routers come with additional features installed. Most routers also include a firewall. Firewalls are discussed in the next section. Some routers will also include a wireless access point (WAP). The WAP allows you to use wireless devices, such as wireless laptops, with the Internet. A firewall controls traffic flow between your network and the Internet. A firewall can be either hardware or software. Windows XP SP2 or higher includes a software firewall. A hardware firewall is included with most routers. A firewall is a very good idea. It can protect you from inbound virus attempts. By inbound virus attempt I mean other computers that will connect to your computer and attempt to infect your computer. You do not want to run a computer directly connected to the Internet, without a firewall. There are just too many other computers out there that can connect and infect you without you even noticing. Just like you can buy a device to allow you to share a hard drive, you can do the same with a printer. A print server connects directly to your printer. Your printer is then shared to all of your computers on the network. This is convent because you do not need to leave the printer hooked to a computer, which must be turned on to print. As you can see there are many different components. Perhaps the final component that I have yet to mention is the cable. These components are connected together with CAT5 Ethernet cable.